Baking (and eating!) 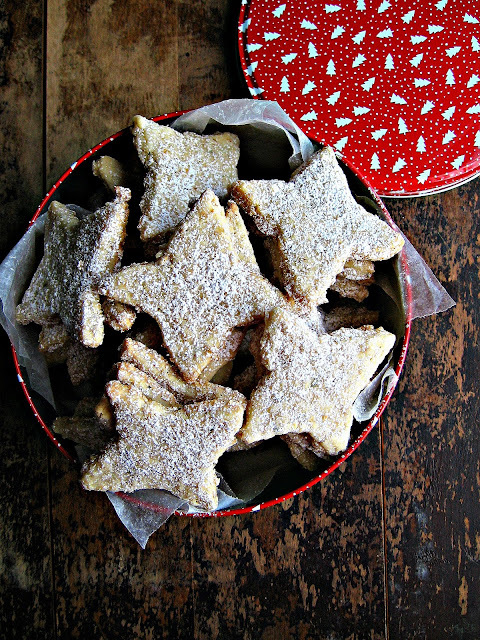 shortbread at Christmastime is absolutely mandatory. As is watching A Charlie Brown Christmas, enjoying Baileys in hot chocolate, and singing along to Christmas Elvis. Is it me or is he damn hot especially handsome in this video? I was never a super huge Elvis fan, but out of all the Elvises I like Christmas Elvis the best. He's way smokin'. Fun Fact: Blue Christmas was a cover...someone else (Doye O'Dell) recorded it first in 1948, but Elvis' version in 1957 made it internationally famoso. It's listed #7 on a Rolling Stone Reader's Poll of the Best Christmas songs, and it ranks right up there with me, too. I'm a little bit drawn to the sadder Christmas songs, not that I'm a particulary sad person, quite the opposite, really. I just like mixing a little maudlin with my merry - just a touch seems to make the merry shine that much brighter. Don't be freaking that there is rosemary in my shortbread, okay? You'll be down with the woodsy/savory/ sweet/buttery concoction of goodness after one bite, promise. These cookies taste like Christmas. 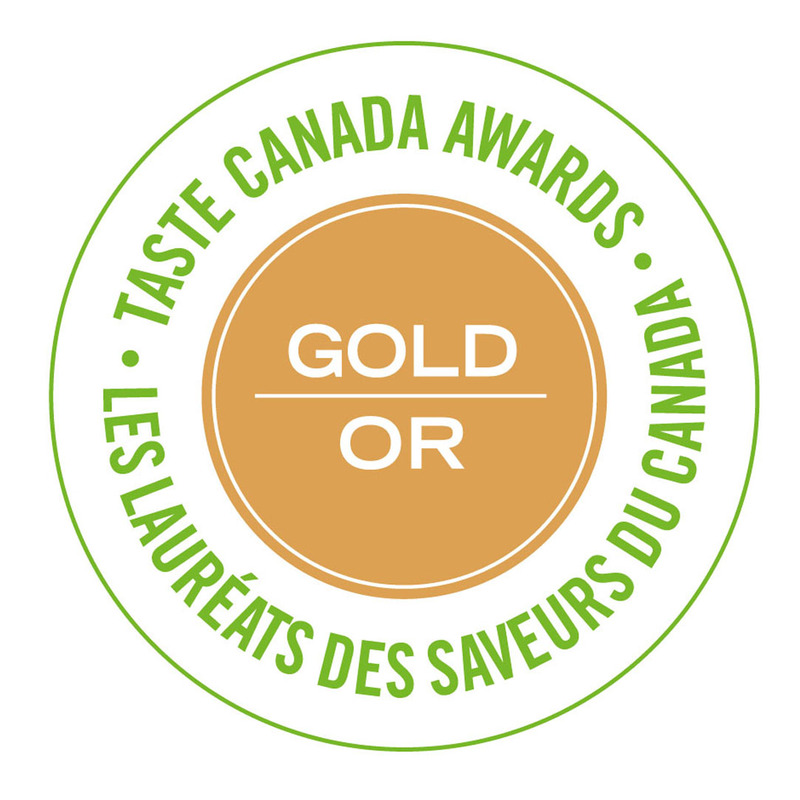 My first taste was well over 10 years ago, when a pastry chef I was working with made a batch. This is her Grandma's recipe and she was gracious enough to share with me back then. 'Tis the season of sharing after all, so think of this as my little prezzie to you. These cookies will flatter any dessert platter and will gather rave reviews and recipe requests, even from people who were at first scared of the rosemary. Trust me. Don't be freaking about the 2 cups of butter either...this makes a massive batch of about 75 cookies. And because there's oatmeal in them they are practically health food. No bubble bursting, please! I rather like rolling the dough out and cutting it into various shapes. Stars are always good. I don't see why you couldn't roll the dough into logs, chill, then slice and bake too. That would probably save time, if you are lacking in that department (who isn't, really?). One of the best things is the smell emanating from the oven while you bake these babies off...rosemary...butter...sugar. Keep an eyeball on them so they don't burn - once they start to brown around the edges I take them out, because over-browned shortbread does nothing for me. 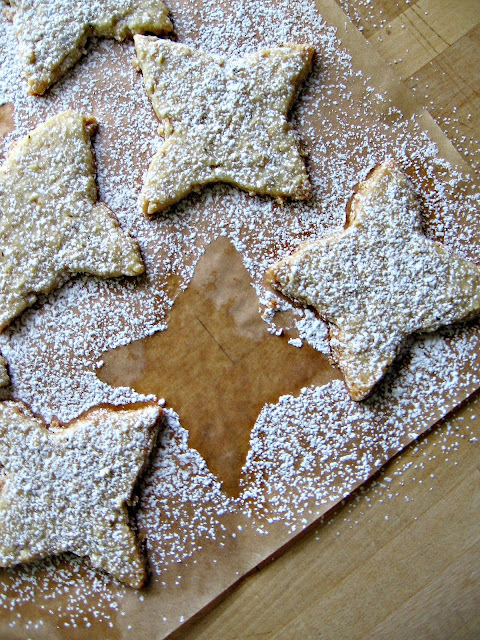 A light dusting of icing sugar and you'll have the prettiest cookies in town. Elvis would definitely approve. In a mixer, cream the butter an sugar until fluffy. Beat in the fresh rosemary. On low, add the flour and oatmeal. Mix until all is incorporated. On a lightly floured surface, fold the dough into a ball, flatten and roll out dough to 1/4 inch thick. Having a little flour on your rolling pin helps too. 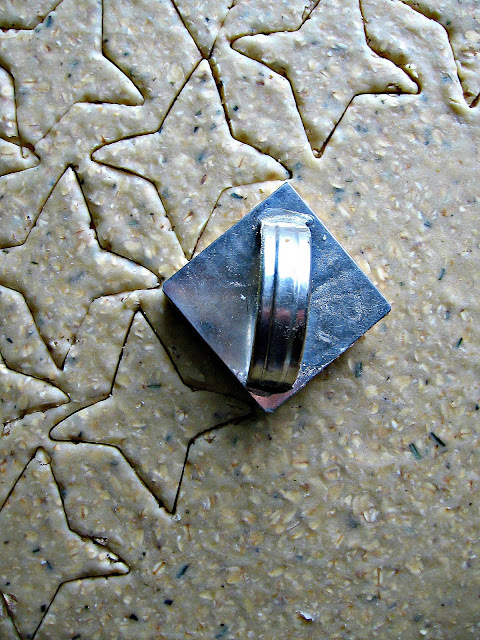 Cut into shapes and place cookies on parchment lined bake sheets. In a preheated 350* oven, bake for about 11 minutes, or until edges start to turn brown. Remove from oven and cool. Repeat with remaining dough. 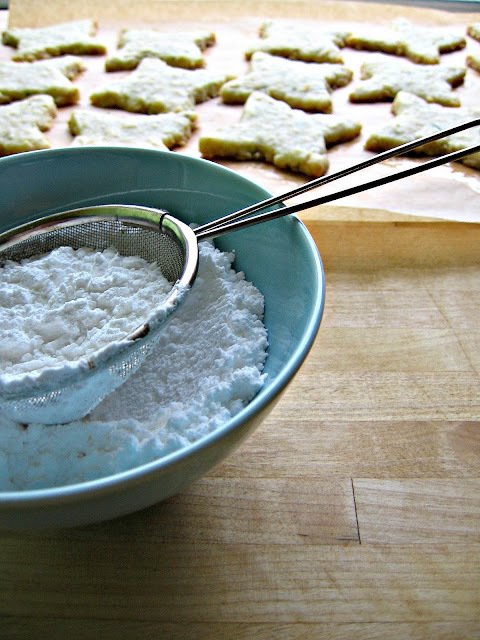 Once all cookies are baked and have cooled down, dust with icing sugar. Makes about 75 cookies. They freeze rather well, too. And how cute do these look all packed up in a pretty tin? Your loved ones will be overJOYed! Christmas Elvis is my favorite too! These cookies look delicious Renee - Elvis would most definitely approve. 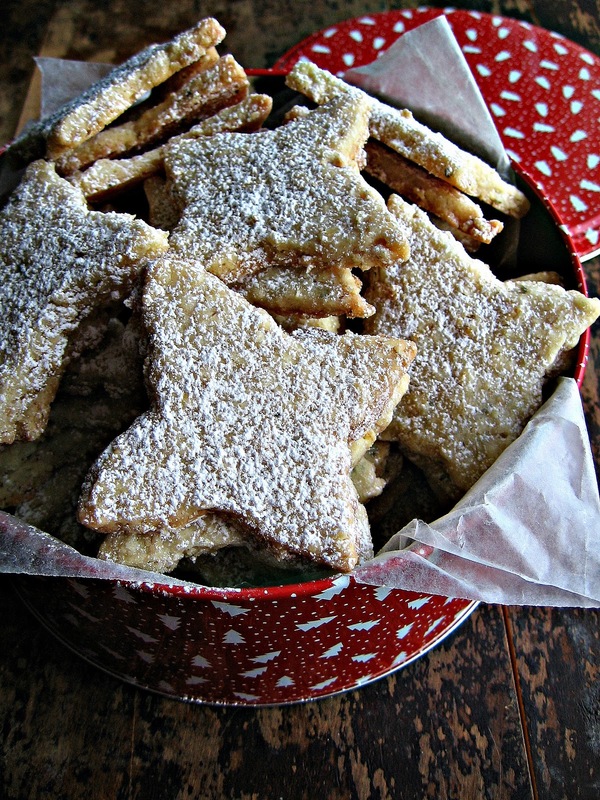 What a unique and new to me recipe for shortbread. It looks lovely. They look like Christams in every bite Renee.Watching that video I really get the effect Elvis had on his adoring fans. Kate, he's the best, no? Paula, I love the unique flavour of these cookies too! Michelle, do it! Bellini - too right. His fans are transfixed! I think it's all about the quivering lips. Wish I had some pretty tins of my own! 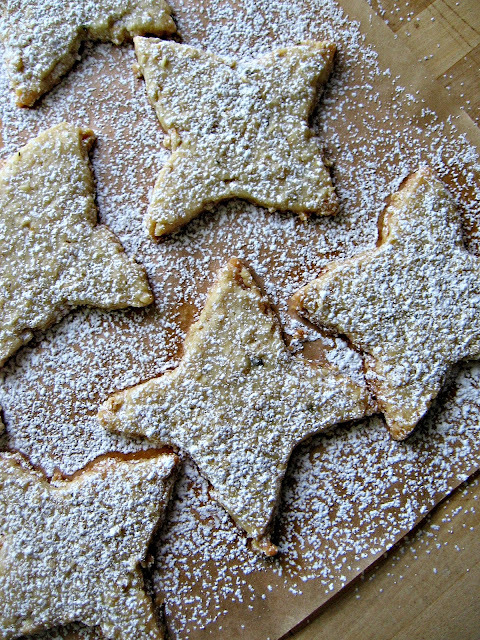 My favorite memory of these cookies was when I used some rosemary I had saved from our stay at Sooke Harbour House (a foodie-locavore paradise), where there were giant rosemary bushes (that in itself would be heaven). 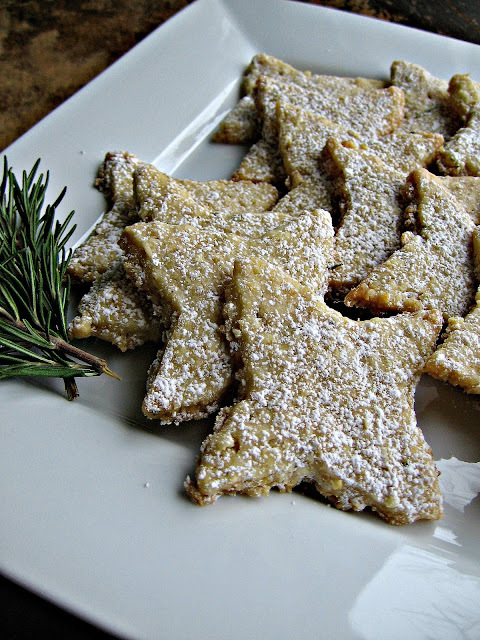 It was so special to be able to use the rosemary for these cookies & share them with others. i love the idea of oatmeal and shortbread! Looks fantastic Renee....and here is a suggestion for you....to that Baileys and Hot Chocolate, add a shot of Butterscotch Schnapps!! I call it a Werther's with Chocolate and there is no better drink to enjoy while sitting in a hot tub watching the snow fall after baking all day! Also, thank you for the card, it is gorgeous!! 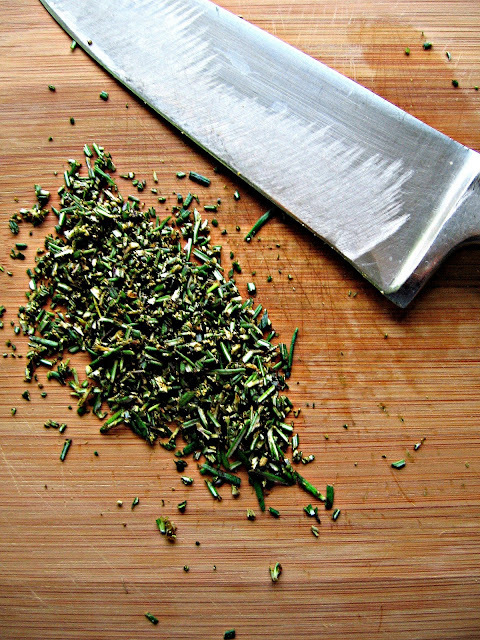 I was with you on the rosemary- it's the oatmeal that made me balk. 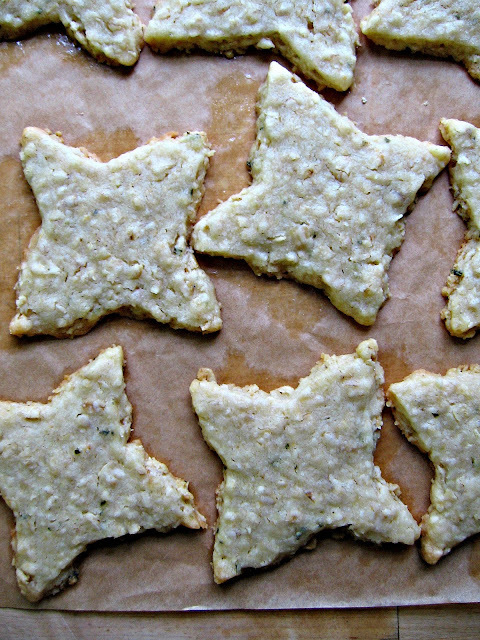 Healthifying something as delicious and decadent as shortbread- isn't that sacrilege? They do look scrumptious, though, and I trust your taste. 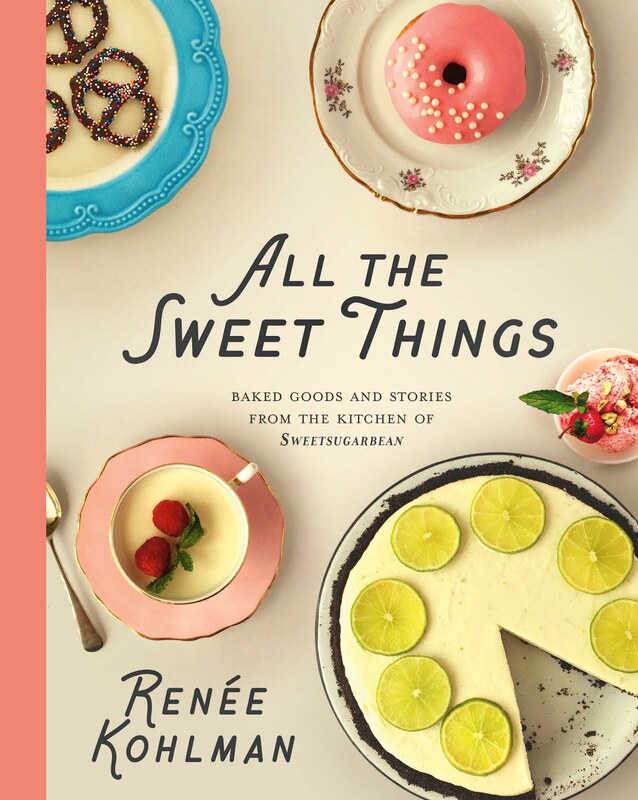 Perhaps you should send along a holiday package with a sampling :-) Hope you're enjoying the season and things aren't too crazy in the kitchen! Thanks so much Kale! Ash - excellent testimonial! AD, it is a great combo! Candus, good to know about the Shnapps. I like! Shelley - the oatmeal is weird, but it works!